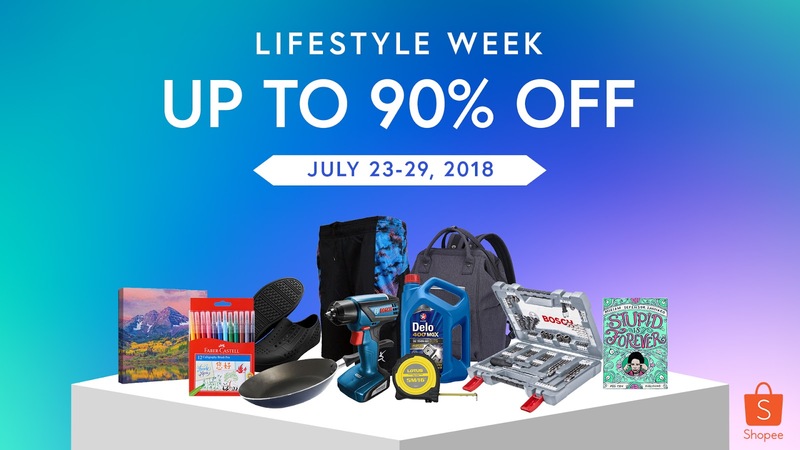 Manila, July 19, 2018 – Live your life to the fullest as Shopee, the leading e-commerce platform in Southeast Asia and Taiwan, brings you its most-awaited sale on lifestyle products at Shopee’s Lifestyle Week! From July 23 to 29, you can expect dozens of hot deals, exclusive bundles, and discounts up to 90% off at your favorite Shopee official stores like Robinsons Appliances, Bosch Philippines , Fukuda, World Balance, Eureka Appliances, Artsy Palace, Below SRP, Tigernu Philippines, RXR, and many more! is offering up to 80% off their printed photo products including Canvas Prints and Imagewrap Hardcovers, so immortalise your precious memories at a fraction of the price from July 23 to 29. Need another reason to shop at Shopee’s Lifestyle Week? From July 23 to 29, Shopee will also provide P100 off with P1,000 minimum spend for the Home &amp; Living, Home Appliances, Sports; Travel, Motoring, Hobbies &amp; Stationery categories to the first 1,000 users who use the voucher code LIFESTYLEWEEK100.